This filter set includes four replacement filters for the 5-Stage RO/DI Water System RO5-25-DI. 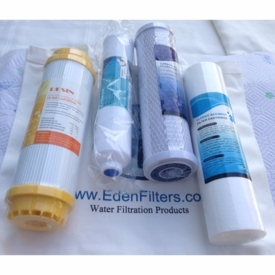 The 4-filter kit includes: 5-micron Sediment Plyspun Filter cartridge, 10-micron Carbon Block Filter Cartridge, Inline GAC filter, and Mixed Bed Deionization Filter Cartridge. The four filters listed above can be changed every twelve months (light use). The kit does not include the 25 GPD RO Membrane Element, which is changed every two years. Water Deionization Inline Filter 2.5"x12"